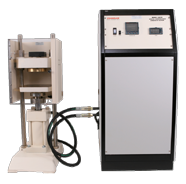 The Model 4207D Compressive Strength Tester is an automatic, digitally-controlled, hydraulic press. It is designed to test the compressive strength of standard two-inch cement cubes in exact compliance with API Spec 10A. The unit is used in research and field laboratories involved in quality assurance, and strength testing of cement blends. The Model 4207D consists the load frame assembly and a separate electronic control / hydraulic power system. The unit is of a suitable size for laboratory use as a freestanding, floor-mounted instrument. The separation of these two primary components enables installation of the load frame in a safe location away from laboratory personnel. The load frame is equipped with a polycarbonate safety shield and door safety interlock. The Model 4207D is also equipped with an over-temperature safety circuit for the hydraulic oil. The Model 4207D Compressive Strength Tester is simple to operate with all of the operational controls conveniently located on the electronic control unit. For easier control plus automatic data logging, the Model 4207D is compatible with Chandler Engineering Model 5270 Data Acquisition Software. Chandler Engineering also manufactures the slurry mixers and pressurized curing chambers used in the preparation of the standard two-inch cement cubes tested by the Model 4207D. 48 in. x 24 in. x 28 in. 54 in. x 28 in. x 30 in.